Looking for a computer cleaning software? Well, BleachBit is the best free and open source cleaner for Linux desktop. BleachBit was originally designed for GNU/Linux to free cache, delete cookies, clear Internet history, shred temporary files, delete logs, and discard junk you didn’t know was there. It’s the best Linux alternative to Windows’ CCleaner. BleachBit is started in 2008, it’s written in Python and uses PyGTK. Since version 0.5.0, it added support for Windows XP, 7, and 8. Simple operation: read the descriptions, check the boxes you want, click preview, and click delete. 2. For Ubuntu, select download the package matches your release version. The package is a .deb file. 3. 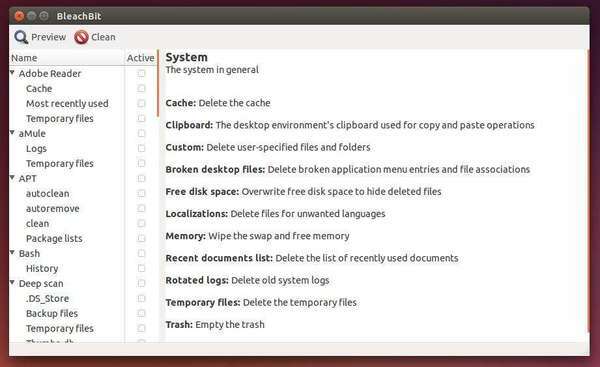 To install it, double click to open the .deb file with Ubuntu Software Center and click the install button. Once installed, start the cleaner from Unity Dash. You can change the language from its Preferences window. Enjoy! To safely use BleachBit please read the descriptions and enable only the options which you understand and need. In general clearing cache is a good place to start to recover a lot of disk space without much risk of losing something you would miss.